WOW! Cheap flights to Hawaii: Honolulu for €549! UPDATE 30.1.: cheap flights from Paris to Hawaii in March available, you can fly to Kahului (Maui) or Honolulu (Oahu) for only €549! Example dates: 3.-12.3., Book here, check screenshot. 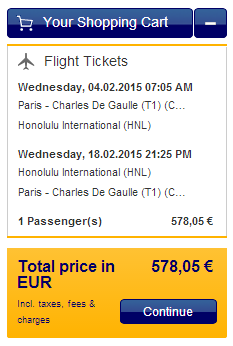 Lufthansa now offers really cheap tickets to Hawaii from France! 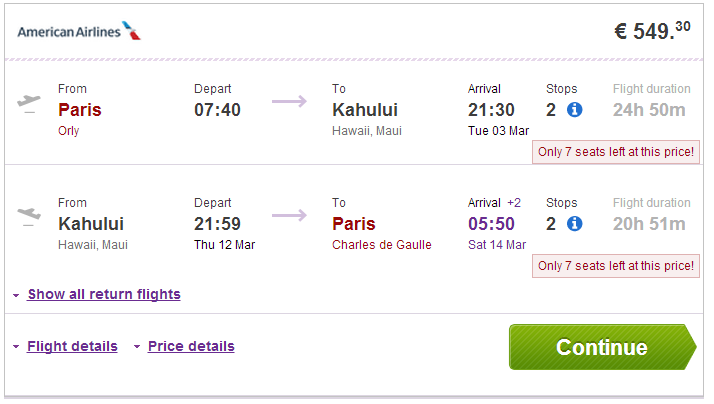 Return ticket from Paris to Honolulu will cost you only €575! Standard fare on this route is around €900! Total travel time is around 23 hours which is pretty great for Hawaii! Book fast directly via Lufthansa! « Cheap flights to Iceland: Reykjavik from London for €75!